Hawthorn has long been regarded by Melburnians as a very desirable place to live. With tree lined streets, spacious parks, numerous restaurants, great transport links, and just six kilometres from the CBD, the suburb is stylish and convenient. It does come with a steep price tag – the median house price is over $1.5 million – but new development Hawthorn Bond has just made the area much more accessible. This striking multi-residential development, which comprises 31 apartments and two retail tenancies, is a collaborative effort by developers Shine Corp, architects One Design Office (ODO) and builders Method Constructions. Hawthorn Bond, named to reference the bricklaying technique used in the development, strikes a very skilful balance – luxurious yet accessible, modern yet authentic and blending in whilst still standing out. ODO has a structure that’s interesting and contemporary whilst still paying homage to Hawthorn’s rich industrial heritage through its brick facade. 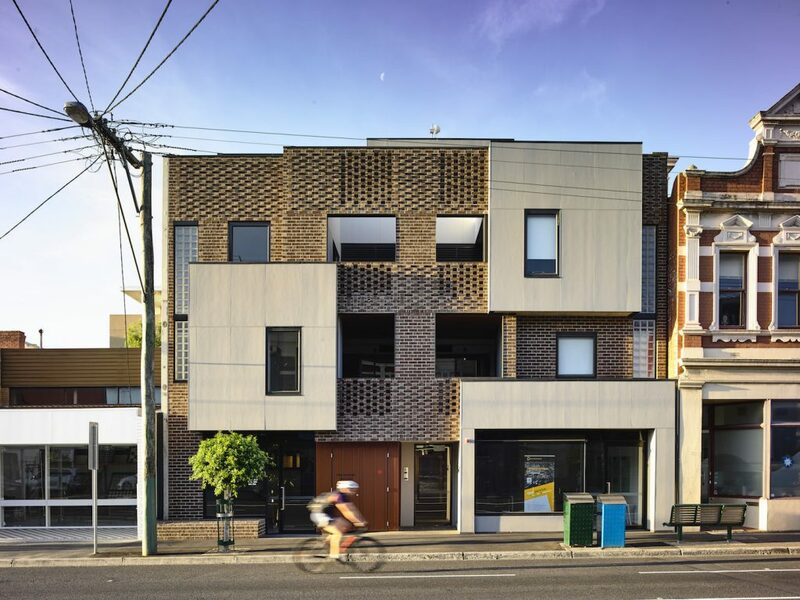 Not only does the brickwork reference Hawthorn’s brick-making history and unique soil composition, it presents the building as an element of the existing streetscape so that the building sits harmoniously within its surroundings. “Combining the area’s heritage and its urban renewal over recent decades, Hawthorn Bond incorporates brick as a common link between the building and its context,” explains ODO director Samson Tiew. Interwoven with suspended concrete slabs and in some instances, laid in the Flemish bond pattern, the building’s brickwork provides visual interest from the street. “We wanted certain areas of the brick to be freestanding hit and miss bonds without any secondary structural support so, to do this, we had to explore Flemish bond techniques,” explains Tiew. Inside the apartments, the industrial look continues with concrete ceilings and steel framed windows softened by pale hardwood flooring and pastel coloured tiles. “This natural interior palette works together to present sophisticated living that celebrates local history, whilst also providing a blank canvas for individual tastes,” says Tiew. Image courtesy of PGH Bricks.